"Roman-style artichokes"is a typical dish of Roman cuisine. The Romans have been cooking and eating artichokes for centuries, as described in Colummella’s De Rustica and in Pliny the Elder’s Naturalis Historia. Currently, the carciofo romanesco del Lazio is cultivated in the coastal area North of Rome, between Ladispoli and Civitavecchia. Traditionally it is prepared “alla romana” (roman style), slowly cooked and seasoned with garlic, parsley, mentuccia, (lesser calamint) salt and olive oil. Together with the Carciofi alla giudia (Jewish style), it represents one of the most famous artichoke dishes of the Roman cuisine. Remove the outer leaves, until you reach the paler ones, and then cut off the hard tips and leave the upper part of the stalk, which should be peeled with a potato peeler to remove the hard outer layer. 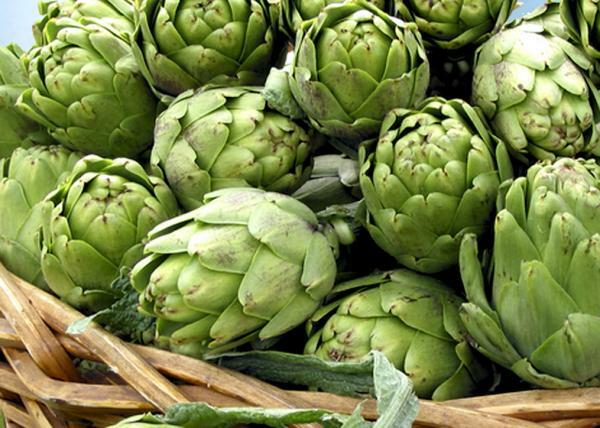 Place the artichokes in a bowl with cold water and squeezed lemon juice, to prevent them from turning brown. Chop the parsley, mint and garlic, then mix them with the salt and pepper. Open the leaves of artichokes, banging them tips down on the work surface to help, and fill them with a little of the chopped seasoning. Put the artichokes, upside down in a tall saucepan. Pour in oil and wine until the artichokes heads are half covered, then add water until they are covered.Leave to cook over a low heat, until the water has completely evaporated (45/50 minutes overall).